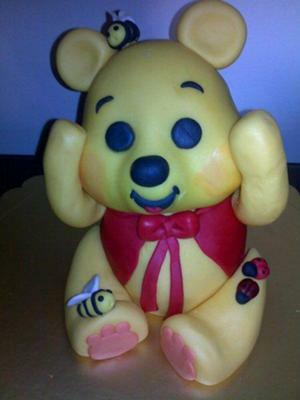 This baby Winnie the Pooh cake was made from chocolate cake mix, sculpted to the shape desired. The trunk and the head (the head work is time consuming and very sensitive work). You need to know where to cut and how to cut not to mess it up. Next, I covered it with butter cream and chilled to firm up, then I covered it with fondant, created the hands and legs from fondant assembled together, it came out very adorable piece of work, I liked it a lot. My niece was very very happy to have it, and she didn't want to cut it. She wanted to keep it, we couldn't persuade her to cut this cake so we cut the other cake for her and left this one.